Pair of fleece-lined supsension cuffs made of superb quality American oil-tan leather, with super strong buckles and fastenings. Hand crafted cuffs with black fleece lining for extra comfort. 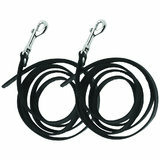 Includes adjustable wrist buckles, and strong D-rings (two per cuff). Chains sold separately. Designed for upright suspension, they provide great support for the wrist and hands.